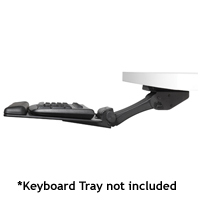 The Staccato Keyboard Arm from KV Waterloo is an ideal solution where storage depth is limited but an adjustable height keyboard tray is desired. The 15.25" track is short enough to permit installation in locations where a traditional full-length storage track will not fit, including many height-adjustable sit-stand desks. The patented "Lift-N-Lock" mechanism provides almost effortless height adjustment from 1.375" - 8.0" below the mounting point. The inclination or "tilt" of the tray can be adjusted from a negative inclination of -20° to +10° using an easily-accessed soft-touch knob. 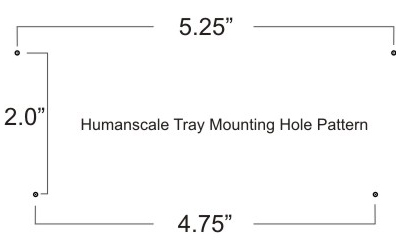 When fully lowered the Staccato offers approximately 9" of tray storage depth. 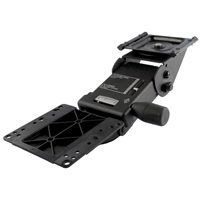 Knee clearance is optimized, with the keyboard tray mount extending less than 0.75" below the tray. The Staccato Keyboard Arm is equipped with plastic glides riding within a heavy-duty steel track. The Staccato is manufactured using recycled materials and is designed for disassembly and recycling. The Staccato can be paired with many keyboard trays but please note that tray depths over 9" will still project about 2". Suggested fully storable tray options are listed in the Accessories section of the "Price & Availability" section below. For situations where there is insufficient space for a 15.25" track the Tenor Trackless Keyboard Arm may be a solution. The KOCHAB Articulating Keyboard Kit by ErgoVerse offers basic keyboard height and tilt adjustability for the budget conscious user. The low cost of the KOCHAB kit makes it an ideal solution for locations where ergonomics are still important but where 1) adjustment will be occasional, 2) full keyboard tray storage is not key, and 3) cost is a factor. The simple design means that height and angle changes are accomplished simultaneously with a single adjustment. One hand is employed to release or tighten the large, easily locked knob while the other hand moves the keyboard to the desired height and angle. The KOCHAB offers 5.3" of elevation adjustment and 9" of storage travel along a 17" track. 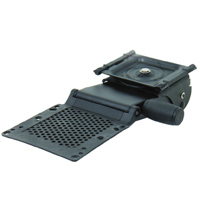 A full 360° swivel accommodates situations where alternative mounting (such as lateral) may be needed and heavy-duty steel construction throughout ensures a stable keyboard surface. 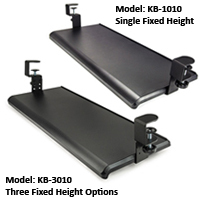 The 27" wide x 11" deep coated MDF keyboard tray offers sufficient room for the largest of keyboards and a mouse. Some assembly is required. Le KOCHAB Articulating Keyboard Kit d`ErgoVerse offre une solution économique d`une hauteur et une inclinaison ajustable pour le clavier. Le kit KOCHAB est une solution idéale à coûx bas pour les endroits où l'ergonomie est toujours importante mais où 1) l'ajustement sera occasionnel, 2) le ranger au complet de la tablette n`est pas nécessaire, et 3) le coût est un facteur. La conception simple signifie que les changements de hauteur et d'angle sont accomplis en même temps avec un seul ajustement. Avec une main, facilement libérer ou serrer le grand bouton, tandis que l'autre main déplacer la tablette à la hauteur et à l'angle désirés. Le KOCHAB offre un ajustement en hauteur de 5,3po et une course de 9po de distance pour ranger sur la glissère/track de 17po. Un pivot complet de 360 ° convient aux situations où un montage alternatif (latéral) peut être nécessaire. Une construction en acier robuste assure une surface de clavier stable. La tablette de clavier MDF est 27po de largeur et 11po de profondeur qui offre suffisamment d'espace pour le plus grand des claviers et une souris. Un peut d`installation est nécessaire. 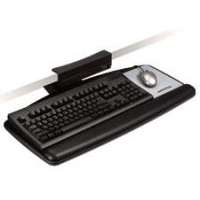 The Desk Clamp Keyboard Tray from Aidata is a simple and economic solution for situations where a temporary or occasional use keyboard tray is required. Constructed of high impact plastic this tray provides a rigid surface for both keyboard and mouse. 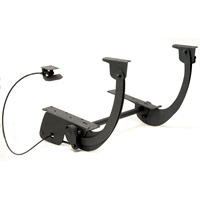 It attaches to the front of any desk surface (up to 40 mm thick) and requires 32" of open space for mounting. Sturdy steel brackets secure the tray firmly in place and glide rails in the underside of the tray permit virtually complete storage. The tray is positioned 4.25" below the mounting surface and on a 1.5" thick surface has approximately 2.75" of clearance between the underside of the desk top and the keyboard tray. Thinner desk tops will offer a greater clearance. 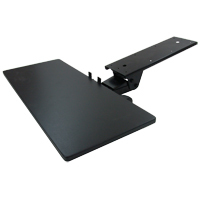 The Desk Clamp Keyboard Tray surface is 27.5" wide and offers a 10.5" depth of flat surface for keyboard and mouse. The front 1.25" is an ergonomic "waterfall" edge designed to reduce the risk of pressure against the underside of the wrist. The rear of the tray has a low ridge to keep both keyboard and mouse from sliding off the rear of the tray. When stored about 1" of the front lip extends forward of the desk surface. With a weight of just 5 lbs this solution is ideal for situations where an individual is traveling to workplaces which may not offer a keyboard tray but where the desk surface is too high to ensure proper ergonomics. Once assembled (less than 5 minutes) the tray can be attached and removed in under a minute and will not mark the existing desk surface. Note: This is not suitable for attachment to glass surfaces. Pressure from the clamp brackets could possibly crack the glass. 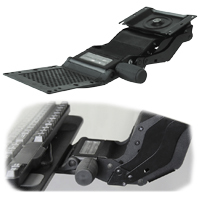 This tray allows easy height, tilt, and swivel positioning of your keyboard. The star-knob adjustment controls height and tilt simultaneously. It includes a full-width leatherette-covered gel palm pad (with anti-microbial protection; 3M model WR340LE) and a 7.25" x 6.25" 3M Precise Optical Mousing Surface (MP200PS) that can be positioned to the left or right of your keyboard. Installation is done without tools in four easy steps, typically in less than 10 minutes. The sliding track is attached via an adhesive strip and the front is secured by hooking the front lip over the desk edge. Also, the keyboard tray is storable, but not fully under the desk (3.0" protrusion); and the tray itself is made of coated MDF (Medium Density Fiber) board. The DE100 Corner Sleeve from Humanscale can be used to create a usable workspace out of a tightly curved or inside right angled corner. The steel plate creates a diagonal bridge (20.375" wide) between the adjacent supporting surfaces, enabling the user to fully utilize the entire workstation. The user is now given access to an expanded work area (right, left and corner), enhancing the ergonomics of the workspace. The shape and dimensions of the DE100 Corner Sleeve make it suitable for desk top keyboard and mouse use. With an upper surface width of 29.5" and a depth of over 12.25" the DE100 Corner Sleeve is compatible with most common keyboard and mouse combinations. 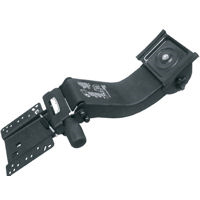 It is also equally suited to keyboard arm and tray deployment as the underside of the unit is pre-drilled to accommodate most common keyboard arms with no additional modifications required. 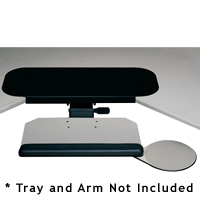 The Keyboard Tray Corner Sleeve can be easily adjusted to fit desks from 1" to 1.5" thick. Note: If the bridging width of the DE100 Corner Sleeve is too great a smaller alternative solution should be considered.